View Quest Retro Mini review | What Hi-Fi? By name, the Retro Mini is a sincere soul. 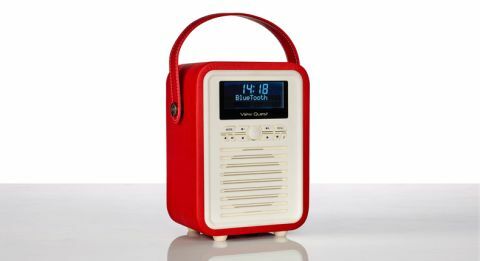 It’s pretty miniature (naturally, smaller than VQ’s Retro model) and would sell just as easily as a 1980s movie prop as a radio thanks to its cream matte face and leatherette wrap. Unless you’re after a plain white or silver radio, you’re in luck. The Retro Mini comes in eleven colours, from mustard to ‘radiant orchard’ (that’s purple to regular folk). Three cutesy Emma Bridgewater designs are also available to match your finest dinnerware, if you don’t mind parting with an extra £20. The Retro Mini looks a cut above the asking price. In truth, we wouldn’t be shocked if we’d been told the price tag had three figures in it, so the fact it’s comfortably under £100 comes as a pleasant surprise. The two strips of plastic buttons go along with the period theme, and we like their soft click when pressed, although for volume and station scanning good old-fashioned dials would be preferable. The 2.4in LCD screen is big and coherent, so making out the time and text from across the room shouldn’t involve squinty eyes. Even at wider angles, you can still make out the display. Specs are anything but retro though, again belying its enticing price. £60 doesn’t just get you DAB, DAB+ and FM tuners (there’s memory to store up to 30 stations of each), you can play music from your portable device via the Retro Mini’s 3.5mm input or wirelessly over Bluetooth. There’s also a headphone output on board and a mini-USB socket for charging devices – handy if your smartphone needs a quick top up. It doesn’t have a built-in rechargeable battery, but a compartment for four AA batteries means it can still be treated to a full day out. And that’s totally feasible too – it weighs less than a kilogram and can be easily ferried around by its leatherette strap or thrown in a handbag. It’s not quite as pocket-friendly as its smaller sibling Blighty, though. It’s worth getting to know the View Quest a little better before popping it on a shelf. Dual alarms can sort you out for weekdays and weekends (a snooze function is there to get you in all sorts of trouble), while ‘MyEQ’ offers five sound modes. The default, ‘Rock’, is little bassy and not much balance can be found in ‘Flat’, ‘Pop’ or ‘Jazz’ either. Stick with ‘Classical’ and you’ll be content whether it’s radio presenters talking or your favourite jam playing on BBC Radio 2. To an extent, anyway. Despite a single driver packing just 5W of power, the Retro Mini is not a timid or frail listen. In fact, it’s reasonably rich and weighty, not to mention capable of reaching decent volume – ideal if you want something that can be heard over the fan cooker or next door’s lawnmower. Though presentation is fairly detailed, voices do sound a little muffled compared to the more expressive Award-winning Pure Evoke D2. It’s like there’s a tin can between the radio presenters and microphone. The class-leading D2 is a tad more articulate and sensitive to the rhythms and inflections of music too. The Retro Mini is another decent radio from ViewQuest. While not the sonic marvel of its (slightly pricier) Pure peer, its sound is easy to entertain for the money and the lovely aesthetics is a real bonus. In our eyes, it’s £60 well spent.